Did you know you are responsible for the safety and upkeep of the sidewalk in front of your home in Kansas City? Have you inspected the sidewalk in front of your house lately? Is it uneven? Is the height difference between the slabs of the sidewalk greater than ¼”? If so, your sidewalk may be in violation of the Americans with Disabilities Act of 1990, and you could be liable for any accident that happens as a result of someone tripping over or being unable to maneuver over the sidewalk in a wheelchair. The KC Department of Public Works has a repair program that may help cover the costs of your sidewalk repair. If you live close to a school, church or bus stop, making sure that your sidewalk complies with the Americans with Disabilities Act. Ensure that the sidewalk is safe, and complies with the act. This means the slabs are even or no more than ¼” difference in height. If you live close to one of these places, it will be more important because more people may travel on that sidewalk than in other parts of the city. Is your sidewalk a small job? We handle the large and the small jobs! Call us today! Take the time to inspect the sidewalk in front of your house. 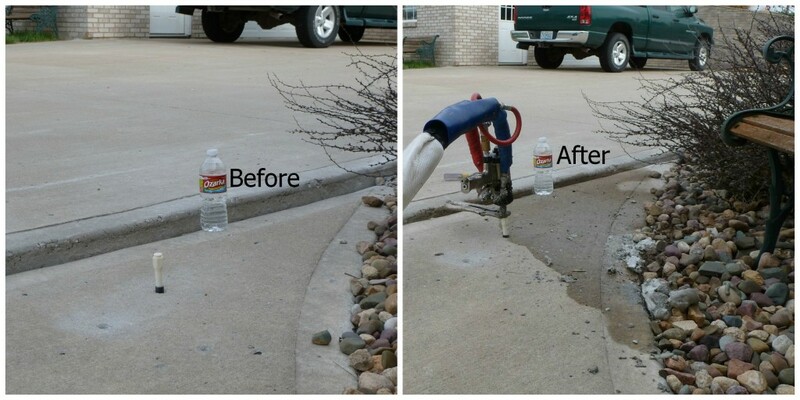 If you find that the sidewalk is uneven or sinking, call us for an estimate. The responsibility for a safe and travel worthy (for wheelchairs) sidewalk in front of your home, rests with you. Having your sidewalk raised and leveled with Concrete Raising Systems is typically 50% less than concrete replacement costs. Our foam jacking uses eco-friendly, U.S. made polyurethane foam to fill in voids created by settling dirt under the concrete sidewalk. The foam raises it level and makes the sidewalk safe and in compliance with state and federal laws. Most of the concrete sidewalks that need repair are usually in good shape, and the concrete does not need to be replaced. When Concrete Raising Systems repairs your uneven sidewalk, we drill a couple of holes, shoot polyurethane foam into the holes and ensuing spaces under your sidewalk. That process raises the sidewalk. We patch the holes, and we’re done in a few hours! It is non-invasive, costs less than typical mud jacking, is guaranteed for two years and is done in a matter of hours, not days! More importantly, you have protected yourself and your family from being named in a possible lawsuit by not complying with the A.D.A. when someone is injured while tripping on the uneven sidewalk in front of your house. We don’t like to scare you, but this is a reality, unfortunately. Don’t take the chance that a guest coming to your home or on thier way to another destination, trips on the sidewalk in from of your home. Get your uneven concrete slabs raised and leveled. Call for a quote and have the work done by reliable tradesman who also own the company! Contact or call us at (816) 419- 8306. We can give you an estimate for your sidewalk repair and make sure your Kansas City sidewalk is safe for everyone!